When the news broke back in May that the songs of Roy Orbison were going to be stripped down and given the lush orchestration of the Royal Philharmonic Orchestra as per the 2005 Elvis Presley #1 album "If I Can Dream", Yours Truly KJS wondered (a) how the earlier material would hold up when mixed using 21st century digital recording techniques and (b) how those wonderful tracks originally produced by ELO maestro Jeff Lynne would fare when adapted. So when "A Love So Beautiful" arrived here at elobeatlesforever (elobf) a few days ago, a few listens were in order but not before I heard "You Got It" broadcast through the speakers at the HMV store in Wolverhampton. I needn't have worried. It sounded marvellous and a few plays of said album thereafter confirmed that an essence of care and some deft enhancements by co-producers Nick Patrick and Don Reedman have combined to deliver a rather good album that retains the magic of the Roy Orbison voice whilst surrounding it in a blanket of classical instrumentation. The new sounds works especially well with ballads such as "In Dreams", "Crying", "Love Hurts", "Blue Angel" (my all time fave Big O song) and the stunning "It's Over" - a song that takes on an even deeper sense of emotion and tragedy this time around. 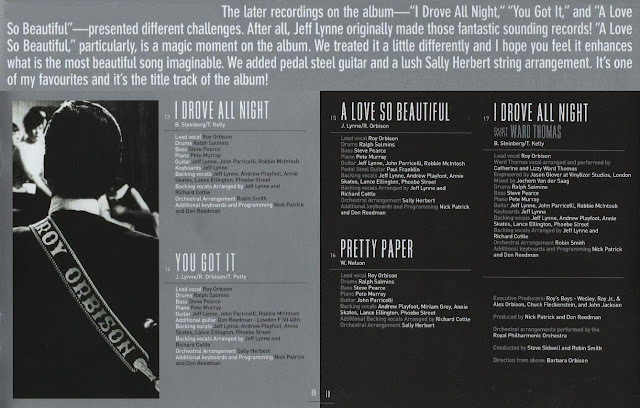 The trio of songs familiar to ELO/Jeff Lynne fans: "I Drove All Night", "A Love So Beautiful" and "You Got It" also work nicely partly because the Jeff Lynne contributions of guitars, keyboards and backing vocals are retained (see credits below) alongside those new, inspired string arrangements. elobeatlesforever (elobf) recommends "A Love So Beautiful" by Roy Orbison with The Royal Philharmonic Orchestra to those enlightened folks who enjoy the music of ELO, Jeff Lynne, The Traveling Wilburys, Roy Orbison, Roy Wood, The Move, The Idle Race, 'Brum Beat', The Beatles and related artistes.